It has been decades since Washington has seen anything like the maelstrom that will consume the capital city — and, perhaps, Donald Trump’s presidency — on Thursday when James B. Comey appears before the Senate Intelligence Committee. The testimony of the former FBI director, whom Trump fired after allegedly asking him to drop a federal investigation of his first national security adviser, will be watched around the world. Not since the 1987 Iran-Contra and 1973 Watergate hearings will so much attention be on Republican and Democratic members as they question — and criticize — a witness. Senate Intelligence members will be looking to get to the bottom of whether Trump might have inappropriately interfered in the FBI’s ongoing investigation of Russia’s 2016 presidential election meddling. More pointedly, the hearing is expected to shed light on whether the sitting president of the United States might have obstructed justice during his conversations with Comey — and perhaps other senior law enforcement and national security officials. The stakes are high for the 15 Republican and Democratic members who will be seated around the dais. GOP senators must appear to be pursuing the truth while avoiding the appearance that they are there solely to discredit Comey and provide political cover to Trump, no matter how serious Comey’s allegations may be, legal experts and historians say. Democrats must strike a measured tone to avoid handing the president ammunition to even partially justify his claims that the Russia scandal is a “witch hunt” intended to shift blame from Hillary Clinton’s failed 2016 White House bid. But those pressures are nothing compared to what is at stake for Donald Trump. Weeks shy of his 200th day in office, Trump — due largely to a laundry list of questionable decisions and self-inflicted wounds — is an embattled chief executive struggling with the basics of governing and whose domestic agenda is stalled due, partially at least, to the Russia-Comey scandal. Here’s why: The only historical analogy that seems to apply here of someone so senior being fired before testifying like this is John Dean, Ryan said, referring to President Richard Nixon’s White House counsel during the Watergate burglary and subsequent cover-up. Dean appeared before the Senate Watergate Committee in July 1973. That seemed to be confirmed as Comey’s opening statement was released on Wednesday. Among the statements Comey will deliver to the committee is his recounting of a Feb. 14 meeting in the Oval Office where Trump asked Comey to drop his probe of former national security adviser Michael Flynn’s interactions with Russian officials. Statements like that, and the tone of Republicans’ questions and body language, will be closely watched. Trump and some top aides appear to have suggested that Comey’s termination and legal concerns were not unconnected — something sure to be a key line of questioning from Intelligence Committee Democrats. He was referring to a memo prepared by Deputy Attorney General Rod Rosenstein — and signed off on by Attorney General Jeff Sessions — that called for axing Comey because he, during the 2016 campaign, went around the department’s chain of command. That memo was delivered to Trump the day he fired Comey and a day after he met with Sessions and Rosenstein. 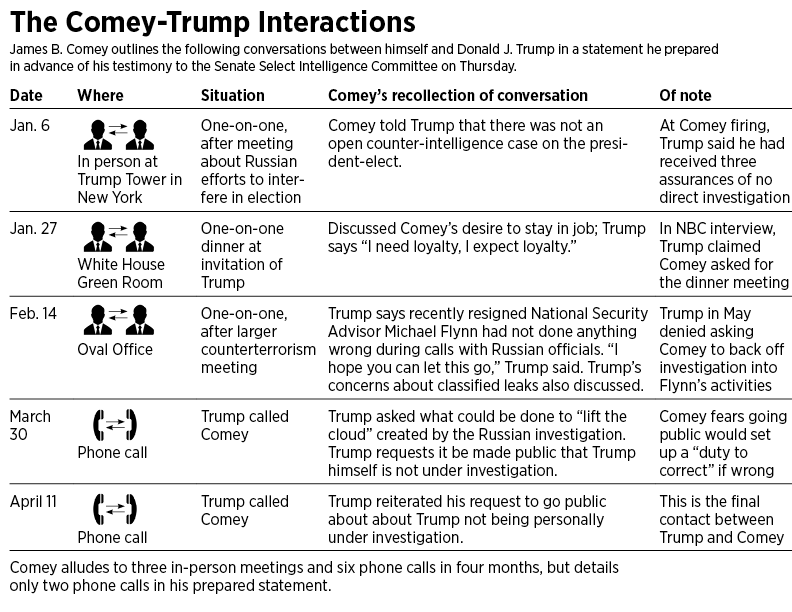 Several media outlets reported eight days later that during an early May meeting at the White House with Russia’s foreign minister and U.S. ambassador, Trump acknowledged that firing Comey relieved “great pressure” on him because of allegations of nefarious ties between his campaign and Russia. “I just fired the head of the FBI. He was crazy, a real nut job,” The New York Times reported, citing a document that summarized the Oval Office meeting. “How Director Comey answers that question — how he frames his conclusions about the president’s intent — will be a very big deal,” Ryan added. It’s not just the fate of the presidency on the line, but Trump’s agenda, should he emerge from the FBI probe and several congressional investigations free of terminal legal or political damage. “There’s no doubt that keeping members focused on investigations detract from our legislative agenda and detracts from what we’re trying to deliver to the American people,” Marc Short, White House legislative affairs chief, told reporters Monday evening. Even before Comey’s testimony, congressional Republicans and Trump allies are questioning Comey’s credibility and downplaying the significance of the hearing. “I think all we’re looking to get is clarity of what happened, and the more we understand the sequence of events … the more confidence the American people will have in the end of the investigation,” South Carolina GOP Sen. Tim Scott said this week. Roger Stone, a longtime Trump political ally, said he expects Senate Intelligence Committee Republicans will aggressively attempt to point out questionable moments from Comey’s lengthy stint as a senior FBI official. He pointed to the former FBI director’s handling of the case involving Clinton’s use of a private email server as secretary of State and the release of damaging electronic messages penned by Clinton and other senior Democratic officials. Stone also said he anticipates questions about an investigation against London-based HSBC, one of the world’s largest banks and financial services firms, on money laundering charges and violations of sanctions against Iran. The bank was fined $1.9 billion. Before Comey was tapped to be FBI director and when he was still in the private sector, Comey was a member of the HSBC board. Stone declined to comment several times when asked if he views Thursday’s hearing as a potential tipping point in his longtime friend’s unlikely presidency. The same was true of a question about whether he has talked to Trump about Comey’s testimony.